If you made it deep into the interior of Animalkind, you know there's a contractarian element in there. That's not the main moral framework of the book, but I need it to explain a thing or two. Take the rescue situation I discuss in Chapter 5: after Hurricane Katrina, there were days of waiting before rescue personnel showed up. People were stranded, including the elderly and incapacitated. Dogs and other animals were stranded as well. I argue that nobody could be dismissed as "just an animal" or "just an old lady"... or whatever. All were entitled to respect and compassion. But difficult decisions had to be made. The first buses out of New Orleans could only save a subset of those in need. I argue that it was right (not just permissible, but obligatory) to make distinctions. You couldn't save hamsters before children. There's a difference between them that it's entirely ethical to notice. In fact, it would be unethical not to notice it. With that endorsement of taking into account differences, I wind up with a hard question. If I'm for seeing differences, why not also see the difference between healthy children and incapacitated old ladies? To be consistent, do I have to be for leaving the old ladies behind with the hamsters? I sure hope not, because my mother would kill me if I said anything like that. This is where the soupcon of contractarianism comes in. I argue that humans are entitled to draw a line just around themselves and ignore differences inside the line. We humans fear for ourselves, our children, and our parents. We'd rather be blind to potentially relevant differences (at least, a lot of the time) than constantly take them into account. Animals don't have these kinds of concerns. So it's not arbitrary or merely "specieist" to choose stronger kinds of equality for ourselves than we do across the board. There's no triage at an emergency room, based on which lives are really more worth saving (even though there might be real differences--be honest!). Everyone gets the same public education. All this ignoring of differences within a human society is all to the good. The same leveling in an all-animal community wouldn't make the same sense. Imagine a zoo is being evacuated. If there is room to take the chimpanzees but not the entire reptile house, ignoring differences wouldn't have the same rationale it has in the all-human case. It wouldn't benefit the animals because they don't have a human being's ability to worry about future applications of a policy or about less capable others. Even the most advantaged human has an interest in seeing the least advantaged get good treatment. The chimpanzees really don't care at all about the iguanas. So: leveling in that context doesn't make the same sense it does for humans only. So far, so good. But then, here's the worry. When policies have an impact on both humans and other animals, equalizing within our subgroup sounds all very well, but it can be a setback for individuals outside of it. Equalizing within the category of humans gives an infirm old lady the same rights as a normal child, so advances her to the same position as the child--ahead of, say, Buffy, the world's most amazing dog. So what starts out innocently enough (equalizing withing the human community) winds up cheating the dog out of her "natural" place in line. What to say? Ignoring intra-human differences is right and proper from one perspective, but problematic from another. If you take both of those perspectives seriously, there's no easy solution. Leaving behind the very infirm old lady violates "the social contract." But advancing her ahead of Buffy ignores real differences in who's most worth saving. I do want the old lady to be saved before Buffy. So I've given the human "social contract" priority over "the natural order." It would be wrong to say that's "just speciesist," because the human social contract has merit and doesn't apply beyond humans for good reasons. There's a moral impulse behind the decision to save the old lady, not mere prejudice in favor of my kind. However I may just have to say there's also a moral impulse behind saving Buffy. Perhaps this is a bonafide moral dilemma, where good reasons can be given to do two different things. Let's get it from the horse's mouth. Ask that little ol' lady what she thinks about any hierarchy that would leave her little Buffy abandoned to the storms and floods of the likes of Katrina. Before considering any theories of species, she might have her pup grasped and hidden, safe from all dangers of nature and evaluators. Let's avoid these awful decisions by planning for animals before disasters. That's just what's now being done. There were a whole lot more provisions for pets when the Gulf Coast was evacuated before Ike (I think it was Ike). Obviously, it's awful to contemplate Buffy being left behind. 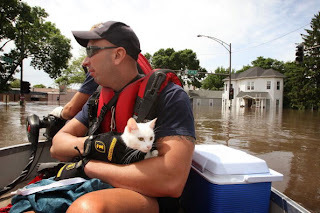 By the way, a touching book dealing (a bit) with animal rescues during Katrina is Zeitoun, by Dave Eggers. If I have understood the argument,it is our concern for every human being's welfare, including the least advantaged, that permits us to draw a line around our species. But that placement of the line is a recent development, and it was not too long ago that the line was drawn around our own race, or our own tribe, and for much the same reason. Those were the individuals for whom we had concern. We have since extended our circle of compassion to include all humans, but why stop there? What if at some future time humans develop the capacity to be concerned about the welfare of all sentient beings? Will that require us to draw the line to include other species than our own? It's true they may not reciprocate our concern, but neither do many of the humans that we include in the magic circle. Isn't the magic circle just a shifting line that we draw according to the temporary values of the time? I argue that humans are entitled to draw a line just around themselves and ignore differences inside the line. We humans fear for ourselves, our children, and our parents. We'd rather be blind to potentially relevant differences (at least, a lot of the time) than constantly take them into account. Animals don't have these kinds of concerns. So it's not arbitrary or merely "speciesist" to choose stronger kinds of equality for ourselves than we do across the board. In other words, humans identify with other humans, so prefer to have natural differences ignored. This is by general consent. On the other hand, chimpanzees don't identify with iguanas. The question, then, is whether this sort of consideration could be used to justify "equalizing" treatment within a smaller subgroup--all men, or all whites. That's an interesting question...I've been thinking (worrying) about it.